Native to deserts in areas of Mexico and southwestern states such as Arizona and New Mexico, agave plants are edible and nutritious. One of the most common ways agave is eaten is in the form of agave nectar, which is a thin syrup used as an alternative to traditional granulated sugar. The plant can also be eaten raw, cooked or dried, and these three forms supply several key nutrients and certain health benefits that the syrup doesn't provide. With the exception of agave nectar, all forms of agave are a good source of iron, a mineral that moves oxygen from the lungs to other parts of the body. A 100-gram serving of raw agave supplies 1.8 milligrams of iron and the same amount of cooked agave contains 3.55 milligrams. Dried agave has 3.65 milligrams of iron per 100-gram serving, which is 46 percent of the 8 milligrams men need each day and 20 percent of the 18 milligrams women require daily. A serving of raw or cooked agave delivers about 40 percent of the 1,000 milligrams of calcium adults need each day and dried agave supplies almost three-fourths of the daily requirement. 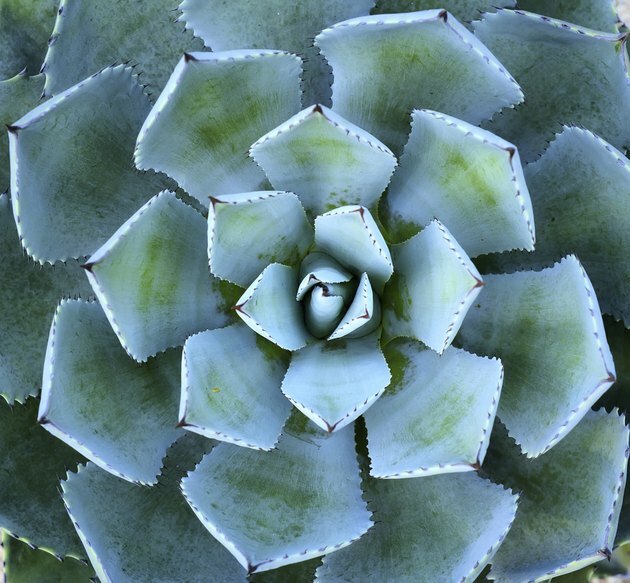 Agave, particularly dried agave, is also a good source of zinc, a mineral necessary for healing wounds. The agave plant contains several compounds with protective benefits. Agave contains saponins, which bind to cholesterol and can help lower overall cholesterol levels, according to Jonny Bowden, author of "The Healthiest Meals on Earth." Saponins might also help inhibit the growth of cancerous tumors, Bowden notes. Agave also contains inulin, a type of fiber that's also a probiotic, or a beneficial type of bacteria. A serving of agave, as opposed to agave nectar, also supplies a good dose of fiber, and plenty of fiber can reduce the risk of constipation. While agave nectar doesn't have the nutrient and health benefits like the agave plant does, it might pay to swap your usual granulated sugar for the nectar in recipes. Agave nectar still contains calories, with 21 per teaspoon, but it's a lower glycemic food, according to a 2010 article published in the "Journal of the Federation of American Societies for Experimental Biology." Studies done with rats suggest that agave nectar can have a positive influence on weight loss and glucose control. Agave nectar, like honey, can replace sugar, and agave nectar is a vegan option for people who don't want to use honey. Agave nectar is sweeter than granulated sugar, so you don't need to use as much to achieve the sweet flavor you're looking for. In recipes, such as baked goods, use one-third less agave nectar than you would sugar and reduce the total liquid content of your recipe by one-fourth, recommends "Eating Well" magazine. Though not common in most parts of the United States, agave can be roasted or eaten raw, such as by adding the stalks to a salad. The flowers are also edible. Agave nectar is the most common way to consume the food, but look for USDA-certified organic varieties because agave imported from Mexico can be contaminated with pesticides, notes "Eating Well." Eating Well: A Healthful Sugar: Is Agave Nectar Healthier Than Sugar or Other Sweeteners?